As those who have been visiting here for a while will know, the original address for this site was karljaspers23. My mentor, Richard M. Owsley, was a student of Prof. Dr. Jaspers. To say that Jaspers had an impact on my thinking would be quite the understatement. Thanks to skepticism.org for this succinct overview. Existentialist philosopher Karl Jaspers dies in Basel, Switzerland. 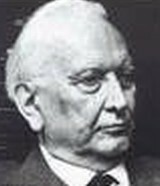 Karl Jaspers will first study law and medicine, even receiving an M.D. from University of Heidelberg and teaching psychiatry at Heidelberg for a while. Jaspers will eventually turn to philosphy, though, and come to argue that philosophy is not a matter of any particular conclusions on any particular set of issues, but rather a specific type of thinking about the way the world is and how the world works…. via Today in History: 26 February 1969: Death of Existentialist Philosopher Karl Jaspers.